WTT (abv. World Trade Tower) is facing Noida Sector 16 Delhi Metro Station. The building is on Noida Toll Road intersection (with Noida Expressway Road) at Rajnigandha Chowk in Noida, Uttar Pradesh. The building has been developed by Et Infra Developers Pvt. Ltd. This is a fully A/C premium Office Space building near Noida Sector 18 with world class finishing. The building with a tall profile has become a Major Landmark in Noida Sector 16 and Noida Sector 18 vicinity. The Commercial Space offices are available for Lease / Rent / Sale and Purchase. Office Space is available in wide range from 550 sq. ft. to 10,000 sq. ft. in variety of customer friendly sizes. The floor plate is 40,000 square feet in size and can be provided on lease as a single floor. Sector-62 Offices, Available For Rent in Noida. The Office Building is 50 mtr. from Delhi Metro Station at Sector-62, Noida. 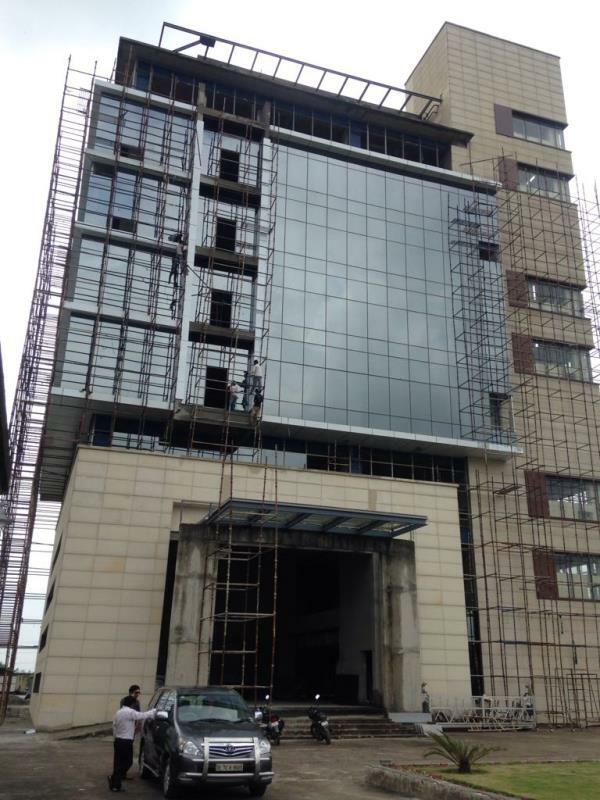 The Recently Inaugurated Building is in booming Corporate/IT/ITeS Office Hub in I-Thum Tower( See Actual Site Image). Brands like Barista, Bikanervala operational. Office Space Available in Multiple-Sizes, 580 sq. ft - 20, 000 sq. ft. The Location has excellent connectivity within 1 km from National Highway-24, and 50 mtr. distance from Delhi Metro Station, Sec-62. The area is transforming rapidly with International MNC Headquarters, Office Hub and Executive Hotels. DXC-Technology, and TCS (Tata Consultancy Services) in adjacent building, Helipad-Adjacent Building Corenthum(0 km). Good Executive presence with Ginger Hotel Noida(<200-mtr. ), Radisson Noida (<5Km), Park Ascent Hotel(<3Km). Nearby residential hub in Indirapuram and schools, DPS Indirapuram(<5Km), Hospitals-Fortis Hospital(<400-mtr. ), Call mobile: 9810810142 for more details. Sector-62 Offices available For Rent in Noida. The Office Building is 50 mtr. from Delhi Metro Station at Sector-62, Noida. The Recently Inaugurated Building is in booming Corporate/IT/ITeS Office Hub in I-Thum Tower( See Actual Site Image). Brands like Barista, Bikanervala operational. Office Space Available in Fexi-Sizes, 580 sq. ft - 20, 000 sq. ft. The Location has excellent connectivity within 1 km from National Highway-24, and 50 mtr. distance from Delhi Metro Station, Sec-62. The area is transforming Rapidly with International MNC Headquarters, Office Hub and Executive Hotels. DXC-Technology, and TCS (Tata Consultancy Services) in adjacent building, Helipad-Adjacent Building Corenthum(0 km). Good Executive presence with Ginger Hotel Noida East (<200-mtr. ), Radisson Noida (<5Km), Park Ascent Hotel(<3Km). Nearby residential hub in Indirapuram and schools, DPS Indirapuram(<5Km), Hospitals-Fortis Hospital(<400-mtr. ), Call mobile: 9810810142 for more details.